It is the time of the year where historically the UK trade flee the freezing UK weather for the sunshine state of Florida, to attend the various antiques shows taking place in Miami and surrounding areas, a chance to sell their stock to a new audience as well as the opportunity to bring home market fresh items, whilst catching a few rays. Regrettably I am not joining the exodus this year, but rest assured I have suitable representation keeping me informed of any great Japanese works of art that might come to light. Whilst on the subject of the USA we are still working on further purchases from the estate that has unearthed such fantastic finds as these Cloisonné enamels, to name a few?, as members of Steve Sly Japanese art you will be the first to hear of some of these exciting new treasures, as and when they land on my doorstep. Closer to home Ryan has settled into his new role at the Surrey auction house, he seems to be enjoying his first few weeks learning all aspects of life in a busy auction environment. Meanwhile I continue to source the finest market fresh items that I can find, whilst January is deemed to be a very quiet month for the antiques trade I honestly cannot recall spending so much time on the road, appraising and indeed purchasing fresh pieces, it is certainly a very encouraging start to the new year. In other news I have incorporated a new company with two close business associates, and as such will be spending much time working on this new and exciting project, whilst antiques related it will not conflict with my number one passion for Japanese art, indeed eventually it will compliment it, understandably it will consume a fair amount of my time each month whilst in the early development stages. It is a very exciting venture and later in the year I will be able to update you. With the loss of Ryan and the new enterprise drawing on my time something had to make way in this years diary, regrettably I will not be attending the tri -annual Antiques for everyone at the NEC Birmingham this year. I shall keep everybody informed as I progress and look forward to any enquiries via telephone, e-mail or via our online gallery , for the immediate future. 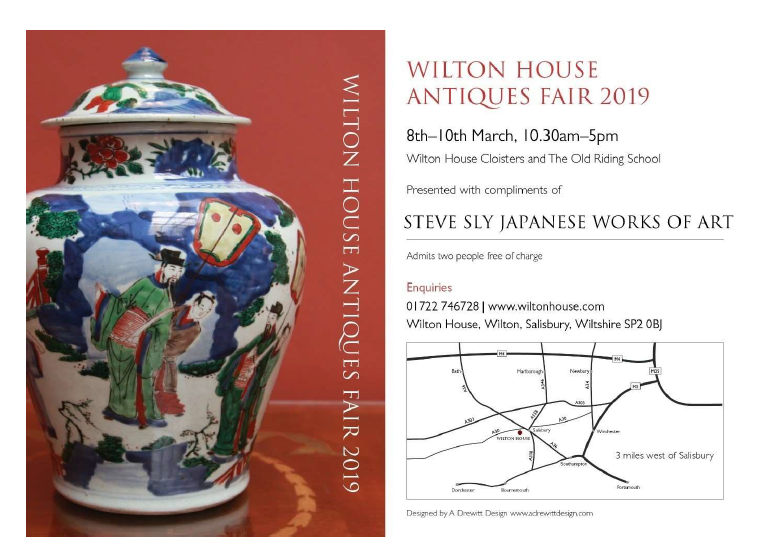 In this months members area we are delighted to offer this wonderful pair of mixed metal vases by the highly regarded Suzuki Chokichi (Kako) at this time working under the banner of the Kiryu Kosho Kaisha Company, Japans first Government backed manufacturing company.